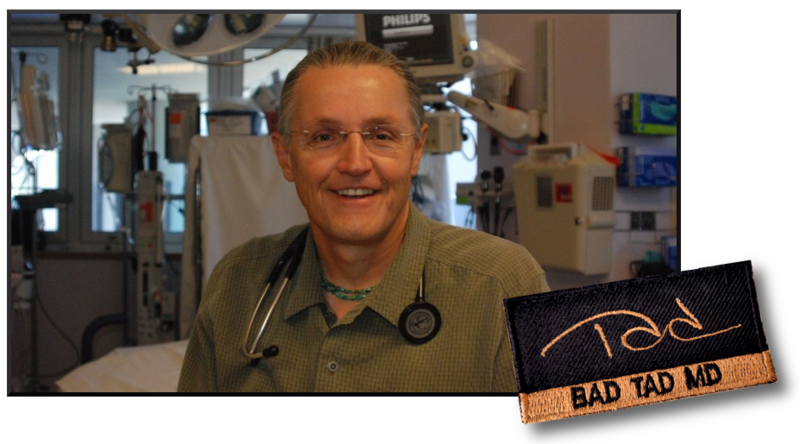 Bad Tad, MD » How Long Have You Been in the Hospital? One night, I had an amazing patient. It is hard to do justice in a note like this just how amazingly bizarre he was. He came in by police at about 6:00 in the morning. I sat and listened for maybe half an hour while he told me his story. He developed complications of gastric banding surgery. He was in a Veterans Administration hospital in city across the state for six months before being transferred to a VA hospital close to us where he had been for a year! He told me about how the police had arrived at his hospital room the day before as the doctors pulled out his IVs and drains. He was taken in hand cuffs to jail where he was booked on warrants for old misdemeanors. He told the most pitiful story of illness, innocence and victimization. As I read through the papers that came with him, there was quite a different story. He was believed to be a sociopath who was malingering in the hospital in order to not go to jail for his felony warrants. He told them he was unable to eat anything so they were giving him total parenteral nutrition (TPN), which means everything you need for survival intravenously. When he was found to be gaining weight, they searched his room and found hidden food. The report went over other crazy stuff they had been putting up with for a year and half with the guy. On the way to the jail, he told them he felt ill so they took him to another hospital near us where he got evaluated, cleared and sent on to jail. As soon as he got to the jail, the nurse who evaluated him decided he was too sick for jail and refused him, sending him to us. So, after a year and a half in a hospital, being deemed safe for discharge then going to a second hospital where he was deemed safe for jail he is now in my ED. For an emergency physician, this is a nightmare. I looked at all of his stuff and sent him back to jail. I am told he refused to walk or to sit up on the bench in the custody van so he was taken back on the floor of the van, handcuffed to the underside of the bench. I am sure that was not the last time we will be seeing this guy.